Combine turkey, onions, yogurt, and contents of gravy mix envelope in saucepan. Drain mushrooms, saving liquid; add water to liquid to make 1/2 cup. Add mushrooms and liquid to turkey mixture. Cook, stirring, until mixture is piping hot, 5 to 10 minutes. Spoon into bread pockets. 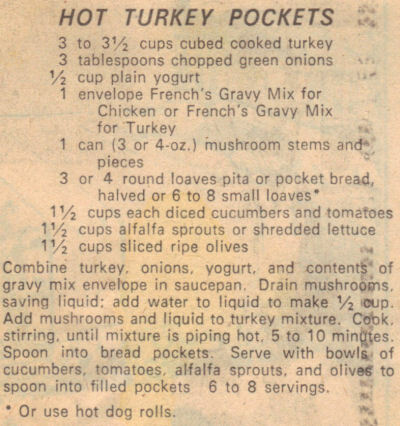 Serve with bowls of cucumbers, tomatoes, alfalfa sprouts, and olives to spoon into filled pockets. 6 to 8 servings. *Or use hot dog rolls.